George Grosz Grey Day 1921. Staatliche Museen zu Berlin, Nationalgalerie. Acquired by the Federal State of Berlin © Estate of George Grosz, Princeton, N.J. 2018. Marking 100 years since the end of the First World War, this exhibition explores the immediate impact of the conflict on British, German and French art. As the first exhibition to examine the culture of memorials alongside new developments in post-war art it will consider how artists responded to the physical and psychological scars left on Europe. Aftermath brings together over 150 works from 1916 to 1932 by artists including George Grosz, Fernand Léger and C.R.W. Nevinson. During this tumultuous period, artists began to explore new imagery and new ways of making art in their responses to the experience of war, the culture of remembrance, and the rebuilding of cities and societies. To mark the centenary of the First World War, free tickets will be available for all veterans and members of the armed forces for the duration of the exhibition. The First World War began to be constructed as memory almost as soon as it had begun. During the war artists created works which reflected on its long-term impact. Battlefield landscapes and images of soldiers’s graves such as William Orpen’s A Grave in a Trench 1917 and Paul Jouve’s Tombe d’un soldat serbe a Kenali 1917 evoked silence and absence in the aftermath of battle. After the armistice official public memorials provided a focus for mourning and remembrance. Artists including Käthe Kollwitz, André Mare and Charles Sargeant Jagger produced sculptural memorials to commemorate those who lost their lives in the conflict. The exhibition explores the different forms that memorials took, and their importance for social and political cohesion. It also shows the more personal memorials created using relics of the battlefield such as shrapnel and mortar shells. Soldiers’ wounds were an alternative memorial, visible in flesh rather than stone, and disabled veterans were a constant reminder of the terrible cost of war. 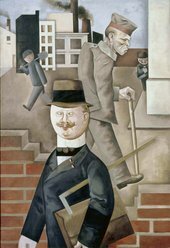 Works such as George Grosz’s Grey Day 1921 and Otto Dix’s Prostitute and Disabled War Veteran 1923 used imagery of disabled veterans to demonstrate the inequalities in German society. In France, veterans were an important part of the visual culture of memorial ceremonies. In Britain, images of wounded soldiers such as Henry Tonks’s medical pastel portraits were usually seen in the context of therapy and healing. This turbulent period also saw the birth of dada and surrealism in the work of Hannah Höch, Max Ernst, André Masson and Edward Burra among others. Artists used new visual forms to process experiences and memories of conflict. Dada photomontages by Hannah Höch reused war imagery while fragmented bodies and prosthetic limbs featured in works like Grosz and Heartfield’s The Petit-Bourgeois Philistine Heartfield Gone Wild. Electro-Mechanical Tatlin Sculpture 1920. As well as the physical and psychological scars left on Europe, the exhibition also shows how post-war society began to rebuild itself, inspiring artists such as Georges Braque, Christian Schad and Winifred Knights to return to classicism and tradition while others such as Fernand Léger, Paul Citroen and C.R.W. Nevinson turned their minds to visions of a technological future in the modern city. Aftermath: Art in the Wake of World War One is curated by Dr Emma Chambers, Curator, Modern British Art and Dr Rachel Rose Smith, Assistant Curator, Modern British Art. The exhibition is accompanied by a catalogue from Tate Publishing and a programme of talks and events in the gallery.